AND since my sister-in-law essentially told me that she would stop speaking to me if I didn't send these at Christmas again, SO I had to make them...I'll share. Begrudgingly. Because you can do the same thing by making your own caramel, melting your own chocolate, and putting your own pretzels into the mix. But that would take about 4 hours longer. BUT you could do laundry at the same time! *These are also "Heaven and Hell" for the number of sentences beginning with "and" or "but" in the above description. I blame this entirely on the mostly manufactured cookies. Nuts - pick your preference. I like pecans and walnuts the best. 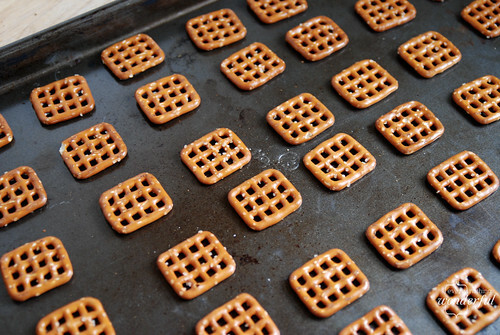 2) Lay pretzels on baking sheet. 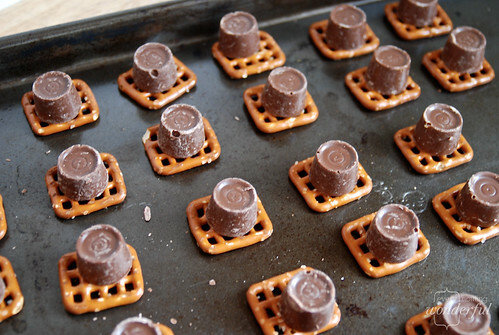 3) Put Rolo candy on top of each pretzel. 4) Bake for 5 minutes. 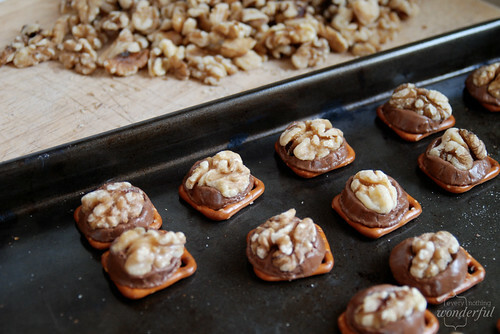 5) Remove from oven and immediately put a nut on top of each Rolo/Pretzel thing (good word, huh?) - push down slightly. 7) Try to share. Be nice if someone "steals" one off the community platter. Pretend you don't know that the entire project took 5 minutes. Give to my sister in law. And now you know...I made that. Sigh again. Haha I love the title of your post! And also your post! You're too funny. Oh I so love making (and eating) these simple candies. Everyone loves them! I love this post! Terrific idea, well stated, super appreciated.